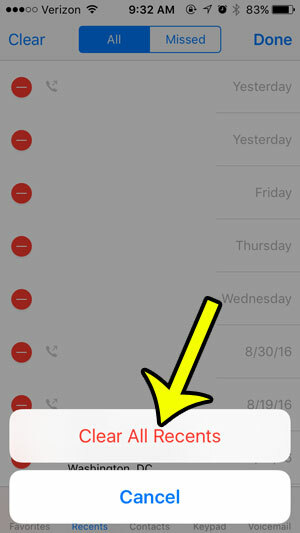 Your iPhone keeps a list of recent calls that you have both made and received. This provides a convenient location for you to call back someone whose call you missed, or to quickly place a repeat call that you had made previously. 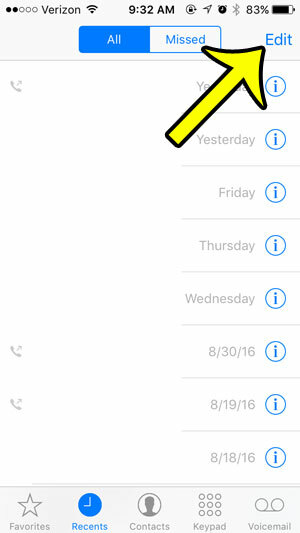 But anyone that has access to your iPhone can see this list of calls, and you might prefer that they not have access to your call history. Our tutorial below will show you a short series of steps that will enable you to delete the entire call history from your device at once. The steps in this guide were written with an iPhone 5, in iOS 9.3. These steps will work for other iPhone models using iOS 9 as well. Note that your cellular provider may keep their own call records for your number, which will not be affected by the deletion of this list. Step 3: Tap the Edit button at the top-right corner of the screen. Step 4: Tap the Clear button at the top-left corner of the screen. 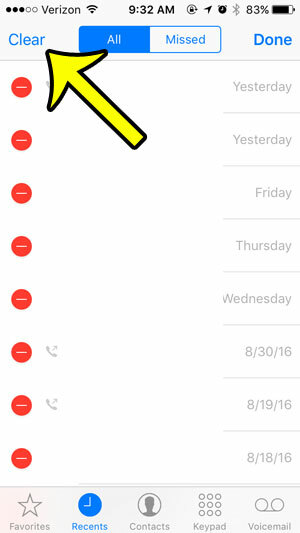 Step 5: Tap the Clear All Recents button at the bottom of the screen to remove all of the calls from this history. There are a lot of other things you can delete on your iPhone, many of which are part of third-party apps. For example, learn how to delete Pandora stations from your iPhone if you have too many and it is becoming difficult to navigate through your list.